The last few weeks has very definitely been about friendship, and I am very lucky with mine. It all started with a lunch in Telford with my partner in crime from work, Teresa. Although I am a regular visitor to see my old work colleagues, its not often that we get some time to ourselves. Needless to say we both talked for England, but there never seems to be enough time to get all the talking in. 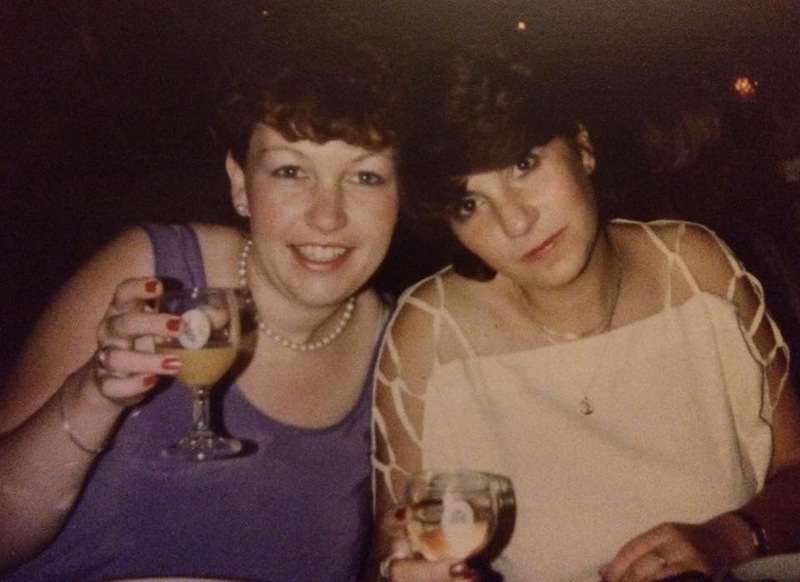 Then I took a trip to Leamington Spa to meet up with Susan, we met in the mid 80’s, as her husband Jim and my ex husband both worked as medical reps at the time. Having both moved around the country over the years we have lost touch a couple of times and found each other again. Having decided it was time to meet up on our own Leamington was the central point for both of us, we could have a good catch up with out any interruption from our other halves, once again the time went all to quickly. Then on my way home on the train I realised that the NET Patient Foundation is also based in Leamington, so next time I may try and call in and say hello. This was closely followed by a visit from my old friend Sharon, we used to work behind the bar together, socialise and go on holiday, more years ago than I care to remember. The last time we saw each other was about 16 years ago, and then we lost touch for a while. Social media came to the rescue and after getting back in touch properly a couple of years ago, we finally managed to see each other. It is one of those friendships where time is irrelevant, she very kindly came down to see me, and it was like no time had gone at all, we just picked up where we left off. Below is a picture of us in our youth, we were to busy gabbing to take an up-to-date one!! The day after Sharon’svisit, my closest old friend from Barrow-in-Furness Bridgette came down for a few days. 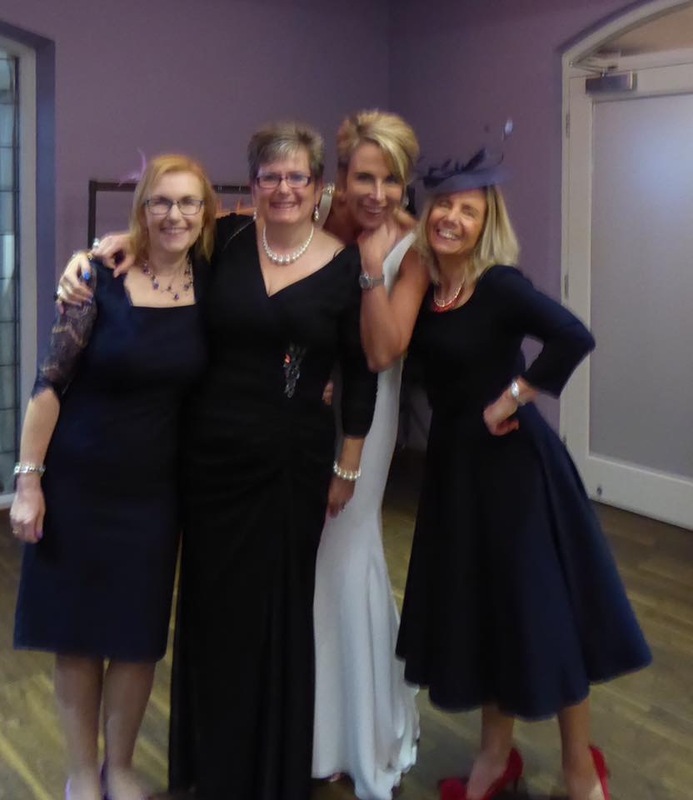 Our children all went to school together, and we have been firm friends from the day we met at the school gates 24 years ago. There have been many ups and downs for both of us over the years, but we have always kept each other going, and it was a shame she couldn’t stay longer. After Bridgette went home, I then had a wedding to attend, an old work colleague from a previous job. There are four of us who have kept in touch and meet up on a regular basis. The wedding was lovely, the bride looked stunning, and it also allowed to me catch up with people I haven’t seen for years. The hardest part was remembering names, the faces were easy. I’m sure many of you know what I mean. This week I went to the works quiz, which is an annual event to fundraise for cancer research. The theme was Halloween and we were all witches with the team name of the Coven!! It was a great night, and out of 21 teams we came 7th overall, as it was a music qui we were amazed that we did so well and got into the top 10, There were some serious quizers taking part. 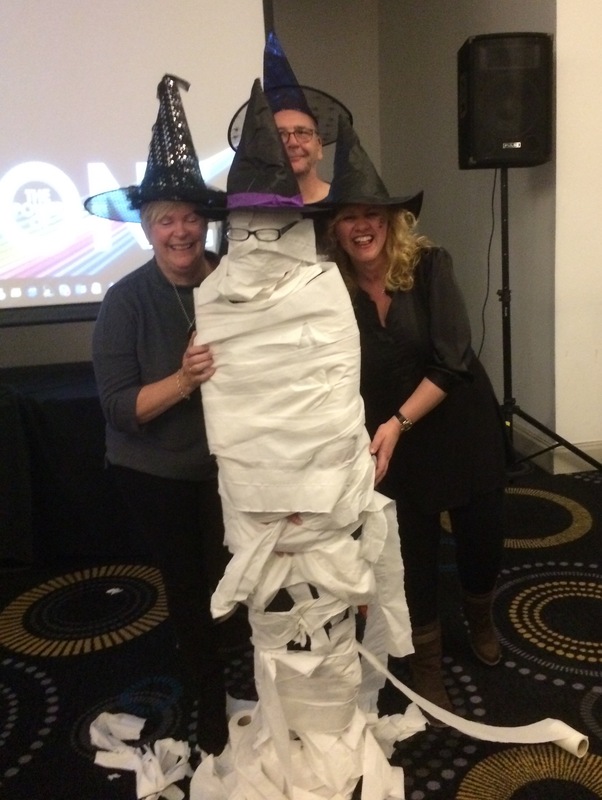 We also won the best dressed mummy award in the toilet roll decorating competition and were joint winners for the best decorated table. Table decorations courtesy of Ann (thank you) who provided us with a big box of Halloween goodies. Sorry to say I only got a picture of the mummy though, but I think about £6000 was raised overall, which is a great achievement, as always the organisers did an excellent job. This last week though, as expected, everything caught up with me and I have been very tired, so apart from the quiz night I went from being a social butterfly, to being a total recluse. It doesn’t help that I have also been struggling with sleep for the past few weeks, more so than usual, which I don’t think helped. I have these blips every so often, normally if I get 3-4 hours sleep in one go I am doing well, but at the minute I am waking up every couple of hours. Most of the time I can just turnover and go back to sleep, but sometimes I just can’t, which leaves me washed out during the day. Unfortunately I do not seem to be one of those people who are able able to sleep during the day either unless I have actually been properly unwell (for me that is). As happened on Saturday just gone, I woke at 2am with excruciating stomach pain, cramps and bloating. Unfortunately the first set of painkillers did not touch it, the heat pack helped a bit, but I was counting the minutes until I could take more painkillers. I even resorted to a hot, and I mean hot, bath, which turned me into a lobster, that helped a little bit, but not for long. I have no idea why it flared up, as I had rested as much as I could that week, there had been a couple of rumblings, but nothing to write home about. Thankfully by 2pm things started to calm down and I was able to get some sleep. 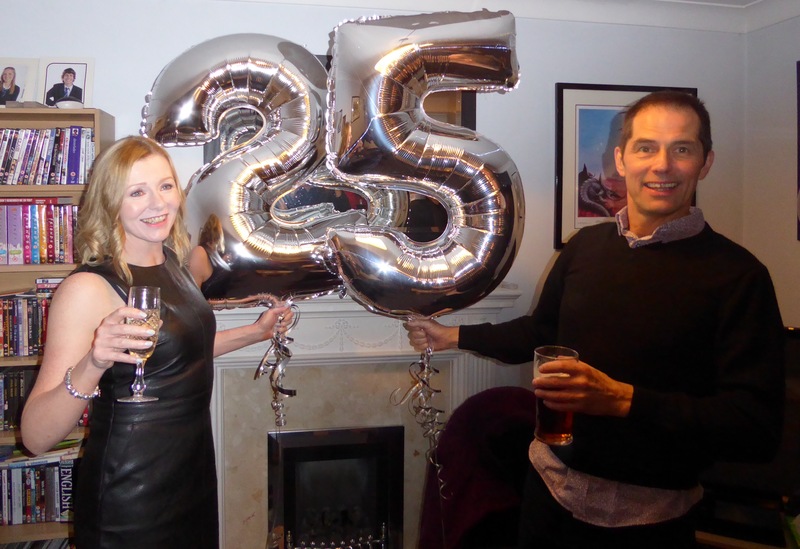 I am so glad it did, as it was our friends and partners in crime, Greg & Shelle’s 25th Wedding celebrations, and at the very least I wanted to be in a fit state to attend the meal. We should have hosted the party afterwards too, but I knew that was going to be beyond my capabilities. A big thank you to, to Don & Janine for stepping in at the last minute. We had a great time at the party, although I was quieter than usual for me, and Sunday was a very lazy day. Next on the agenda is my PET Scan and liver MRI this coming Wednesday, followed by a month of contemplation as I await my results. So fingers crossed.